With the world’s largest debts, Brazil’s deeply indebted sugar industry, the world’s largest, faces an uncertain future. With Brazil’s 366 sugar mills now in debt to the tune of about $30 billion, more than the industry’s annual revenues, companies have cut back on key investments at mills and in the cane fields. The average plantation is now 14 years old, so productivity is plummeting. Sixty mills have closed in the past 15 years, and a further 30 have suspended payments to creditors. The world sugar price is low at the moment, so mills are giving preference to ethanol rather than sugar. Up to 3mt (million tonnes) less of the sweetener will be produced this year than the 38.5mt of 2017 and exports will fall by that amount this year. has long been used to major change. For most of its long history, sugar was dominant, but on several occasions in the past 30 years, ethanol has proved more popular, as is the case now. In the past couple of years, less than half of the 750mt of cane produced — 90% of it in the centre south of the country — has been made into sugar. The majority of the cane is now being refined into ethanol, and most is used to fuel the country’s 30 million cars — some pure, some blended with gasolene. A new source of income for most of the 200 new mills built between 2003–2008 is the sale of electricity. Virtually all of the new mills incorporated high pressure boilers, which make better use of the sugar cane waste, produced when the cane is crushed. Such boilers have been added at many older mills as well. Most of the sugar produced in Brazil is of the high quality ‘crystal’ variety, which needs little further processing before it can be classified as ‘refined’. Brazil’s ‘crystal’ is exported to about 80 countries, a list headed last year by India, the world’s second-largest producing country. India is sometimes obliged to import some sugar, to meet contract commitments. However, since then, cane has increasingly been planted in the mainly flat centre south. Three quarters of the sugar made in the centre south, is exported from the port of Santos, with Paranagua handling 18%. Only 4% of the total now leaves from Maceo, in the north east. Unusually in a country where 90% of all goods are moved by road, virtually all the sugar exported from Santos travels to the port by train, a distance of 300–600km. A fleet of specialist hopper wagons has been built, and new storage and loading facilities built at ports. 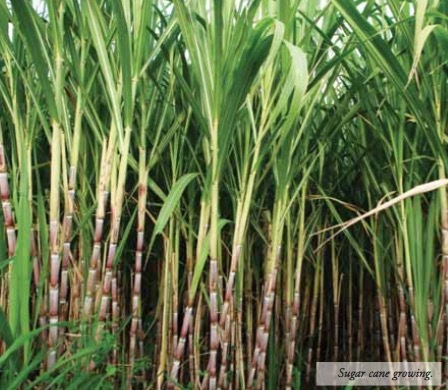 Until the late 1970s, virtually all Brazil’s cane was refined into sugar, with only a small proportion of it made into ethanol. The majority was used to make beverages, or for medicinal purposes. At that time, Brazil imported virtually all of the oil used by its small, but fast-growing. fleet of motor vehicles. But a war in the Middle East caused the price of oil to shoot up, to the point that imports of crude cost Brazil as much as all its exports earned. This provoked a major crisis and the govern- ment turned to the sugar industry to solve it. Dozens of new refineries able to make ethanol were built, most of them attached to existing sugar mills, some standing alone, while the area planted to cane shot up. The motor industry developed a new range of cars equipped with engines designed to run on 100% ethanol. Such vehicles were not taxed, nor was the fuel, so sales of alcohol- powered cars soon exceeded those of cars fitted with gasoline engines. However, this state of affairs did not last long. The oil price fell and Brazil broadened its range of exports, notably that of soya beans and meal, but also of meat and market pulp. Most important of all, substantial reserves of oil were found in Brazil, mainly offshore, from the early 1970s on. Subsidies on ethanol were first cut, then withdrawn entirely, while the popularity of vehicles using ethanol declined. Ethanol is very corrosive, so fuel systems were damaged, and fuel tanks leaked, which irritated motorists. By that time, however, world demand for sugar was increasing and has continued to grow by about 2% a year, so mills switched back to sugar. Brazil soon became the world’s leading sugar exporter, at its peak, being responsible for more than half of all the sugar traded worldwide. If subsequent rises in the price of crude oil caused by hostilities in the Middle East did not affect Brazil, fast becoming a major oil producer, it also brought opportunities for the sugar industry, convinced that exporting ethanol had a great potential. The United States was already making ethanol fuel from maize, a far more costly process than making it from sugar cane, and Brazil started exporting cheaper ethanol to there. A big mill building programme was started, with the latest generation of mills able to process 2mt of cane a year. The area planted to cane doubled, with plantations spreading further to the west. Pipelines were built to take ethanol from the mills to cities and ports. The motor industry had developed a new generation of ‘flex’ engines, which could run on either gasoline, pure ethanol, or any blend of the two. Sensors allowed ignition systems to adjust to whatever was in the tank, so the domestic market for ethanol grew strongly again. Until very recently, the price of fossil fuels had been held below the world price in Brazil, in a misguided attempt to reduce inflation, always a big problem there. Subsidies for fossil fuels meant ethanol was far less profitable than sugar, so in some years, mills channelled close to 60% of all the cane to making sugar, the maximum share possible. Due mainly to bad mismanagement, the Brazilian economy has experienced four years of crisis, while the state-owned oil company, Petrobras, was involved in a major corruption crisis, which brought it close to financial collapse. To save Petrobras, subsidies for fossil fuels were scrapped, with the result that the price of gasoline and diesel rose to the point that ethanol became much more competitive once again. In the past two years, mills have devoted up to 60% of the cane to making ethanol fuel. But a new challenge now looms — electric vehicles. None are yet made in Brazil, but imports have begun and it seems unlikely that Brazil will buck the worldwide trend to switching from Otto cycle engines, whatever fuel they use, to electric ones. Brazil is unusual that the great majority of its electricity is generated at large hydroelectric power stations. Numerous gas-fired stations have also been built, to guarantee power when supplies of hydroelectricity are reduced by drought. An increasing number of wind and solar power plants have also been built, as weather conditions in Brazil are ideal for both. In such a scenario, what is the future for ethanol, and for the country’s sugar industry as a whole? Some suggest that Brazil’s unique experience with ethanol, could allow the country to ignore the expected growth in electric vehicles and concentrate on ethanol. But this point of view does not extend to the sugar industry’s main body Unica, which, backed by the government, is drawing up a ‘National Plan for Biofuels’. One suggestion is that ethanol could be used to generate the extra electricity which will be needed to charge the millions of batteries which will be used in future. For the time being, the world population is growing fast enough to mean a fall in demand for sugar because of the spectre of obesity, is not a problem, although it could become one. It all means that Brazil’s sugar industry, which has adapted to numerous major changes in its long life, will face more challenges ahead.